This week I’ve been working on some wool scarves since we are moving into the cooler fall weather. 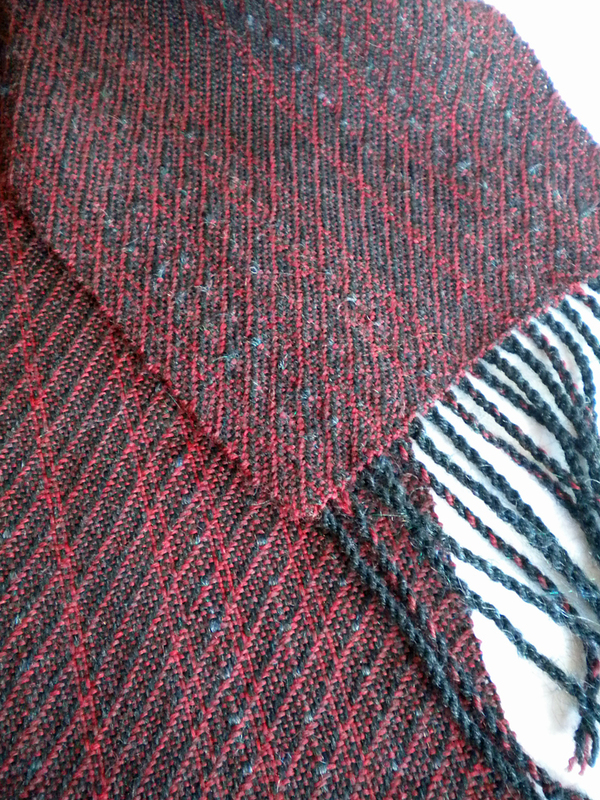 I had some slate Shetland wool and some cranberry Jaggerspun wool, both 2/8 weight, that I thought would go well together. And for an added interest, I put in a few threads of some iridescent black rayon which has quite a “hairy” look. I thought a little fluff in the scarves would be nice. I sett the warp fairly loose, just 16 ends per inch, to give the wool room to bloom in the finishing process. (What a difference from the 52 epi satin weave on my other loom!) I also focused on beating very lightly, 15 picks per inch. I didn’t want to make a stiff board – I’ve done that before and that scarf was not very pleasing! Fortunately, I had half a yard of warp at the end that I could play with, so I wove it up the same as the scarves and took it to the wash machine. It didn’t look like it was finished yet after one minute of agitation, so I left it in for another minute. Then I laid the sample out to dry flat. 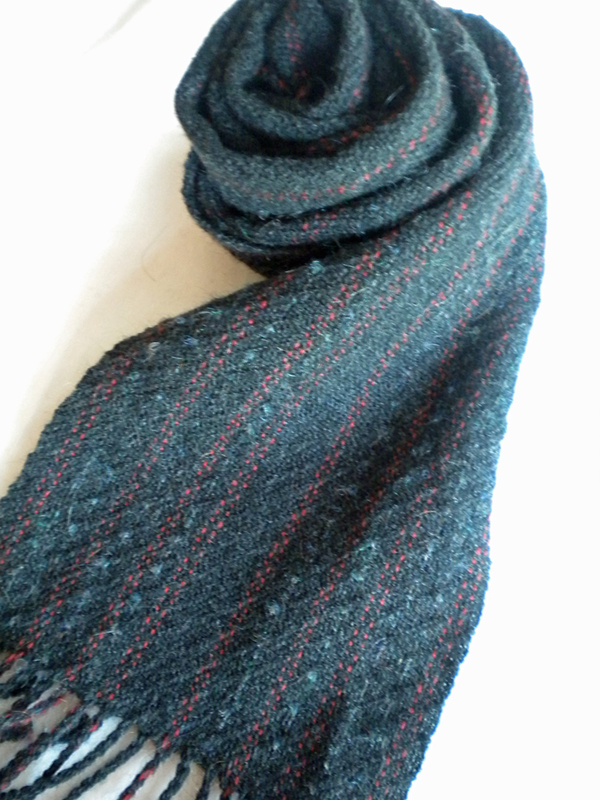 The wool opened up nicely, resulting in a soft and light-weight fabric. The rayon fibers did not fluff like I’d expected, so I gave the surface a little brushing. More vigorous brushing would be necessary if I really want the rayon to come to the surface. It will probably work its way out as the scarves are worn, but for now, the rayon just gives the surface a slightly grey cast. 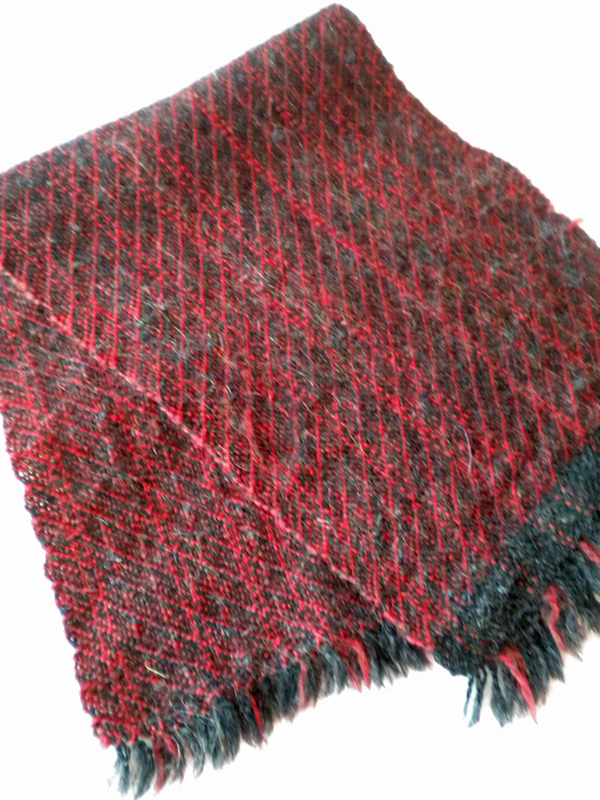 The rayon also didn’t shrink up the same as the wool, so there is a little rippling. That is to be expected when combining different fibers, but I’m glad I didn’t use too much of it. Now I had a little more confidence in how to finish the actual scarves. I chose to agitate in very warm water for 1 ½ minutes only and rinse in the same temperature water. This is not a project I could pop in the washer and walk away—it needed to be watched to prevent felting. All in all, this was a good learning experience. I may have more wool to work with in the future since I have lots of fiber to spin in my closet. From this comfortable starting place, I can consider more wool projects in the coming year. What is your latest learning project? Share your progress!